Do you want to know what the Amazon Echo is truly capable of? Do you feel you’re getting the best out of Alexa? Whether you want to (1) make home life easier with the Amazon Echo,(2) setup Alexa in minimal time, or (3) understand all of what Alexa can and cannot do currently, this Amazon Echo User Guide will get you there. How many lost, tireless, frustrated hours would it take for you to learn all of this on your own? Amazon Echo 2016 User Guide focuses on clear, concise, and simple step-by-step instructions that will allow you to command Alexa in any home situation. You’ll walk away knowing exactly what to do to make your home life more enjoyable with Alexa. This book doesn’t share what can easily be found through Google nor is it littered with vague details that help no one. This guide is your first step to becoming an expert on the Amazon Echo in minimal time. Why listen to me? I’m a three-time #1 Amazon Best Selling Author in Computers & Technology and Consumer Guides and I’ve sold over 50,000 books on technology! What will you learn about Amazon Echo? Leave behind the difficult way of doing things, the future is here with Amazon Echo, and it will only get better and better with Alexa’s never ending updates. 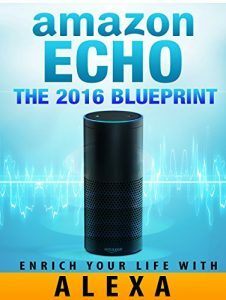 The Echo has already improved thousands of lives around the world, with this user guide at your command, your home life could be even better. Get off the fence about the Amazon Echo and see if it’s really worth its weight in gold. Find out what Alexa is truly capable of.